If you’ve played the original NES Mario game, then you’re probably going to love this new flash game that came out on Wednesday. 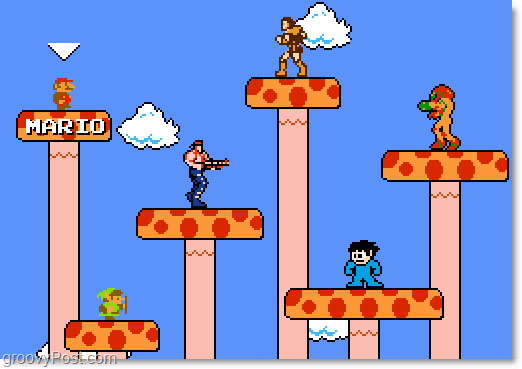 That’s right; it’s the original Mario NES in your browser but with a twist. They’ve brought in a roundhouse cast of other famous Nintendo characters. Super Mario Crossover by explodingRabbit is a fun browser based flash game that allows you to play through the old (and great) 1985 Super Mario Bros NES. However they’ve thrown in a changeup, and now you can play through the game using the looks and abilities of five other Nintendo favorites: Link, Bill R, Simon, Mega Man, and Samus Aran. Where are these guys from? Mario It’s his game to begin with! Picking a character is easy, and the game has instructions along the way, but there isn’t any manual for it, so I’ve done my best here to list all of the controls for every character in the game. 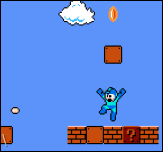 Note that all attacks will take out blocks just as if you were hitting them with your head as Mario. Use the Left and Right arrow keys to move. Mario is the only character that can run, but he doesn’t have any extra special abilities. 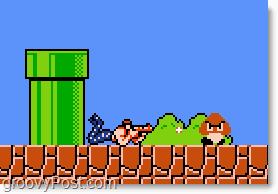 Have fun this weekend sniping Goombas and blasting Flying Koopas! Already played the game? Tell us what you thought in the comments section below! NICE! Had a lot of fun playing this one, who would have thought I could play mario in my browser, let alone have extra “PWN” characters in it. There is Nothing quite like sniping goombas! I tell ya! @KoopaKing – Yeah the flash app really took me down memory lane. I’m glad it was a Friday because I blew about an hour on that game hehehe. @Kalyan – Yeah… I wasted a few minutes on this one.. (60). what about you?